[Robert] Moses’ first great achievement, at the end of the 1920s, was the creation of a public space radically different from anything that had existed anywhere before: Jones Beach State Park on Long Island, just beyond the bounds of New York City along the Atlantic. This beach, which opened in the summer of 1929…is so immense that it can easily hold a half million people on a hot Sunday in July without any sense of congestion. Its most striking feature as a landscape is its amazing clarity of space and form: absolutely flat, blindingly white expanses of sand, stretching forth to the horizon in a straight wide band, cut on one side by the clear, pure, endless blue of the sea, and on the other by the boardwalk’s sharp unbroken line of brown…Jones Beach offers a spectacular display of the primary forms of nature—earth, sun, water, sky—but nature here appears with an abstract horizontal purity and a luminous clarity that only culture can create. Jones Beach State Park and Jones Island which stretches east of the park were the creation of master builder Robert Moses…By dredging sand from what is now the State Boat Channel, Moses raised the elevation of the barrier islands by fourteen feet, connecting several small islands into one long stretch topped by Ocean Parkway. Moses created a great ‘people’s park’ from what he described as mosquito infested swamps and small islands. From this humble beginning as swampland, Jones Beach State Park is now one of New York’s most-visited parks, with 6 to 8 million visitors per year, and it is listed in the National Register of Historic Places. 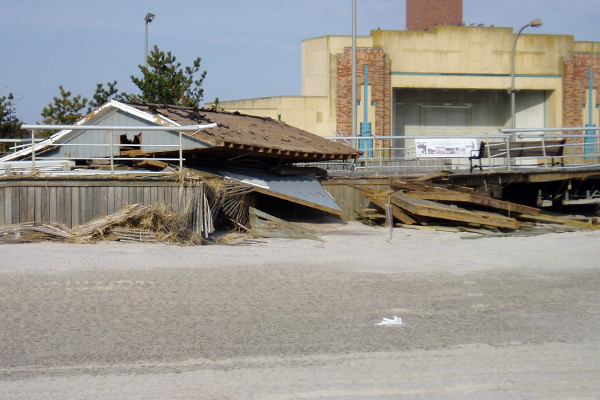 New York State parks officials have a huge job ahead of them in repairing Jones Beach State Park, which was dilapidated before Hurricane Sandy and devastated after, its boardwalk crumpled and its buildings ravaged. The park’s central mall, designed in Robert Moses’ day to evoke an ocean liner, today looks like a ship’s deck after a bad encounter with a very large, cold, floating object somewhere in the North Atlantic. Earlier this spring, Jones Beach received some much-needed attention. 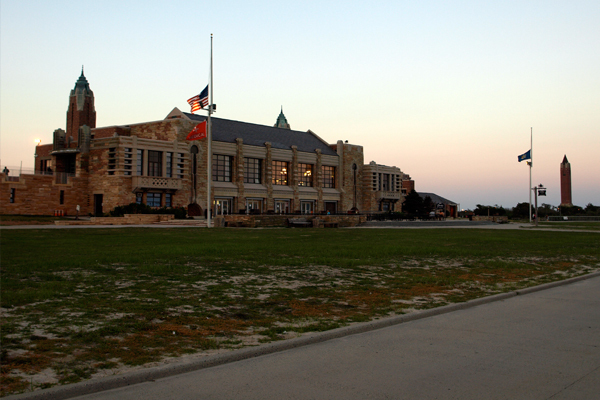 On March 20, 2014, New York Governor Andrew Cuomo announced Jones Beach State Park’s Revitalization Plan, emphasizing the importance of restoring the park’s historic grandeur, strengthening its resiliency to storms, and improving and expanding recreation options. The preliminary drawings included in the Draft Conceptual Proposal were completed by Rhodeside & Harwell and Beyer Blinder Belle, and they depict an array of proposed updates that will need to balance imperatives to preserve and restore with the equally important addition of new park features. Among the changes illustrated are the restoration of the Central Mall’s formal landscape and plantings and the development of the East Mall with a new tea garden, picnic area, and parking area with porous pavement. 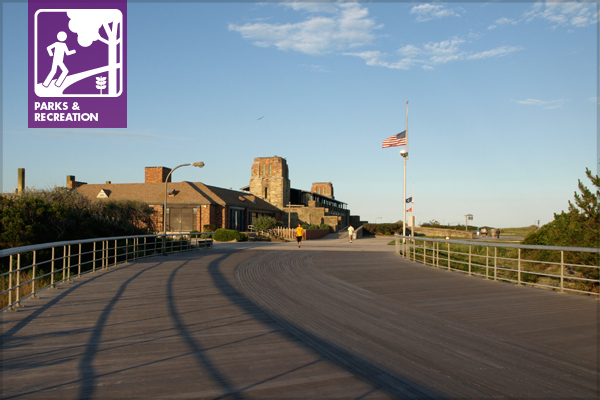 Other planned changes include restoring the lawns around the East and West Bathhouses, building additional shade structures, and expanding the popular Jones Beach bike route. This summer, a pilot outdoor food court—organized in partnership with Brooklyn Flea—will take over a spot on the East Mall that has been vacant for years. In the future, the East Mall Marketplace will be expanded, with a green roof as shown in the renderings—an exciting change to what had been a giant, waterlogged hole in the ground for years, and a dramatic improvement from the 86,000-square-foot catering hall and restaurant that was previously proposed for the site. A restored natural area with flood-resistant vegetation, an elevated adventure playground, rock climbing walk, zip line, and splash pad are among the other proposed changes that should one day make the East Mall a far more inviting place. However you plan to celebrate Memorial Day weekend—whether at the beach, by the pool, enjoying a backyard BBQ, or watching some fireworks—I’m sure you’ll find yourself in a park (or maybe even at Jones Beach!) one day soon. I hope you remember to appreciate the monumental efforts needed both to create a park and to sustain it through the years. Previous Article A Great Place to Play in Nature?